Previous questions have address the beam divergence angles and the expected signal attenuation for laser communication between spacecraft. However, I was wondering what is a typical receiver aperture for a laser comms receiver, and whether these are usually fixed to a spacecraft or mounted on a set of gimbals. The ERDS equipment seems to be mounted on a one-axis gimbal. Ultimately, I would like to determine the attitude pointing accuracy needed for a LEO to LEO laser inter-satellite communication. Inter-satellite radio communication has a number of strict requirements on the frequency used, making it difficult to develop and test in a lab without a large amount of funding (23 GHz oscillators are not that cheap). The linked image is a 125mm telescope in a coarse-pointing hemispherical (two axis) mount. It has a field of view of about 2.5mrad in acquisition mode, which drops to 0.5mrad for data transfer. It’s backed up by fine-pointing optics with sub-10$\mu$rad pointing and sub-$\mu$rad co-linearity, consistent with a diffraction limited beam. Spatial acquisition is performed using the collimated communication beam instead of an additional highly divergentbeacon laser. 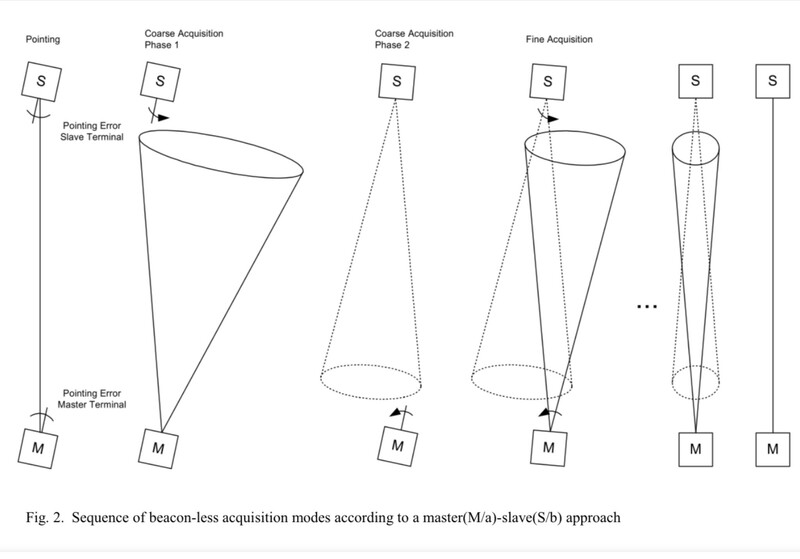 The beacon-less acquisition procedure is shown in Fig.2. Both LCTs need to know the direction of their counter LCT with S/C AOCS typical accuracy (2,500 μrad), the so-called uncertainty cone. After initial pointing the acquisition sequence is initiated. Coarse Acquisition phase1 starts in a master-slave mode. The master LCT-a scans and hits the counter (slave) LCT-b (at least) once per scan spiral. While LCT-a continues scan spiraling, the counter LCT-b iteratively adjusts itself to the wave front of LCT-a beam flashes ending up with a remaining small angular deviation. In Coarse Acquisition phase 2 the roles are switched. Now LCT-a passively adjusts itself to the wavefront of LCT-b scan spiral flashes. Since LCT-b is already quite well aligned from Phase1, the scans and alignment of LCT-a can be performed quickly. During the subsequent Fine Acquisition phase both LCTs scan while also adjusting themselves further in parallel. The scan spirals and the remaining misalignments are progressively reduced until coherent tracking lock in. Not the answer you're looking for? Browse other questions tagged communication attitude laser or ask your own question. How can I compute the attitude of a satellite given its yaw, pitch, roll, and velocity? Does any satellite communicate only through laser?